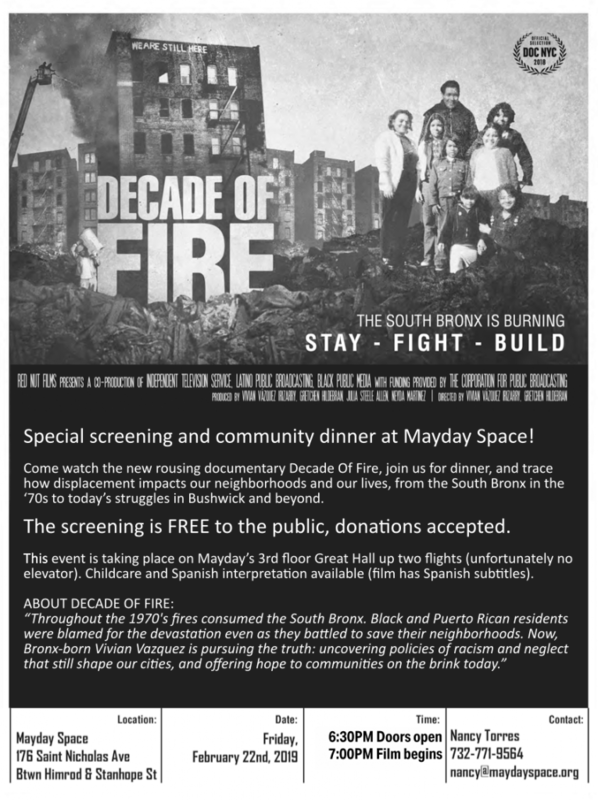 Join us for a special screening and community dinner at Mayday Space! Come watch the rousing new documentary Decade Of Fire, break bread, and trace how displacement impacts our neighborhoods and our lives, from the South Bronx in the ‘70s to today’s struggles in Bushwick and beyond. Throughout the 1970′s fires consumed the South Bronx. Black and Puerto Rican residents were blamed for the devastation even as they battled to save their neighborhoods. Now, Bronx-born Vivian Vazquez is pursuing the truth: uncovering policies of racism and neglect that still shape our cities, and offering hope to communities on the brink today. 9:00 – Communal dinner: the Mayday crew offers a free home-cooked meal around tables where everyone can reflect on the film, learn from long-term residents, and re-imagine the city we want and deserve! DIRECTIONS: Mayday Space is located at 176 St Nicholas Avenue in Bushwick, a short walk from Dekalb Ave on the L train. ACCESSIBILITY: Childcare and Spanish interpretation available (film has Spanish subtitles). This event is taking place on Mayday’s 3rd floor Great Hall up two flights (unfortunately no elevator). RSVP: Please RSVP HERE to secure your spot. 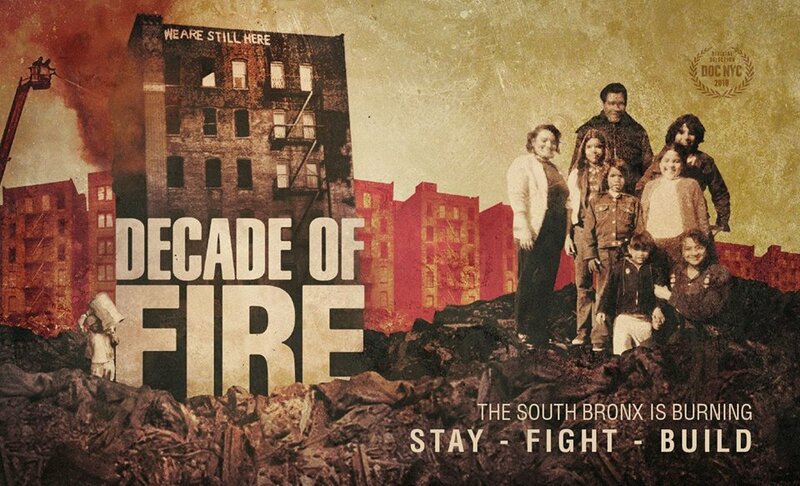 The Five Boro Story Project is honored to be one of the sponsors for the the Bushwick premiere of Decade Of Fire, in coordination with a dozen organizations in battleground neighborhoods, including Anti-Eviction Mapping Project, the Brooklyn Anti-Gentrification Network, Cuir Kitchen Brigade, El Puente, G Rebls, Mayday Space, Mi Casa No Es Su Casa, Ridgewood Tenants Union, United Neighbors Organization, and Club A Kitchen. After the NYC roll out of the film, Decade Of Fire will hit the road to spark community engagement and support grassroots movements in cities facing displacement and neglect from Detroit to Puerto Rico. We’ll be back with more events this summer! Stay tuned for details on our upcoming events, including a “Jamaica Love Letter” series! Stories from our recent events “Almost Home/Casi Llegando a Casa” and “Bushwick Love Letter” will be up on YouTube soon. Be sure to check our YouTube for more stories, and stay tuned for announcements about our next events!